Electron Density results and challenge! We wanted to give you an update on the latest Cryo-EM puzzles. 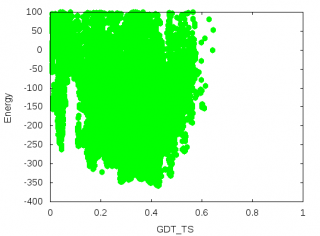 Each green dot represents a Foldit solution plotted against GDT_TS (where a value closer to 1.0 indicates a model closer to what we believe is the native structure) and Rosetta energy (where a very negative value corresponds to a very high Foldit score). 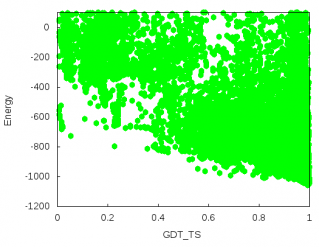 So the further to the right you are, the closer you are to the correct fold... and the lower you are, the better your Foldit score. We don't know why we were surprised, as Foldit players never cease to amaze us with your incredible results! Clearly the starting models we provided you with were nowhere near the native (they were actually 5 different CASP13 server models. You can read more about this at the very bottom if you like). We realize how big 221-residues is for a Foldit puzzle already, which is why we are giving you over 2 weeks to work on it with electron density. We know this is a big ask, but we also know that if anyone can do this: it's you! Best of luck, and keep up the great folding! As we mentioned in Puzzle 1554, the recent puzzles are part of a large protein complex with multiple subunits, which has recently been the target of some cryo-electron microscopy (cryo-EM) experiments. These complexes were actually targets in CASP13 this past summer, but the experimentalists were kind enough to provide us with their cryo-EM data once CASP was over. The first subunit (from Puzzle 1554) was part of this CASP13 target and the recent 221-residue subunit (Puzzle 1579) was part of this CASP13 target. You can see how large these subunits are, which is why we tackled the 149-residue protein first, and trimmed the 229-residue one for the most recent puzzle. Most interestingly, Puzzle 1579 has no known homologs (or related proteins that have already been solved), which explains why the CASP servers had so much trouble with their predictions. It's really interesting to see on the right of the electron density enabled results that the score for solutions that were basically dead on varied quite significantly; I'm guessing these were intermediary data points from score refinement states? I would've also loved to see where my final, leaderboard credit solution ended up on that graph for the sake of self-evaluation. Maybe an interactive graph could be made sometime for this? 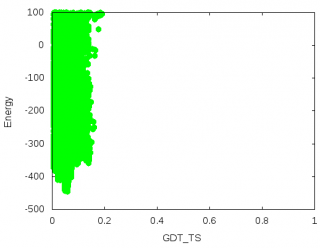 Indeed, the global distance test (GDT_TS) only looks at the c-alpha backbone, so it completely ignores the sidechains. You can imagine that your backbone would be spot on, but all the sidechains are clashing horribly (resulting in a terrible Rosetta energy). As for your suggestion, an interactive graph would be really cool! Imagine if you were logged in on the website and it would color all your dots on the graph differently! Exactly... unfortunately the starting models were so far away from the correct topology, that you'll have to use the density as your guide this time around!